Not so today. 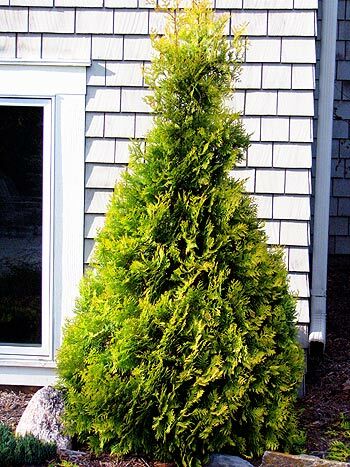 If you’re looking for a stellar small upright evergreen that really stands out, Yellow Ribbon is your plant. Extremely resistant to winter burn, it retains its golden-yellow tip foliage throughout the year. As with all arbs, Yellow Ribbon does best in full sun. If you want to shear it a few times a year and keep it tight and formal, full sun is essential. However, I have planted it in areas of light shade from a high tree canopy where plants received only three hours of direct afternoon sun, and plants do very well. Better than a ‘Techny,’ certainly, which when planted in part sun will turn into a thinning, scraggly specimen in five to ten years. The obvious benefit of the yellow foliage color is one’s ability to contrast it with purple, bronze, green, and blue foliages. 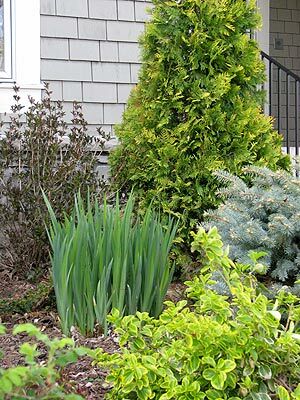 Arborvitae adapt pretty well to most soils, but prefer a soil that has some drainage and enough organic matter to stay moist for several days after watering. I have found over the years that arborvitae like ample water in their first couple of seasons. They become quite drought resistant after they have become established, but would always rather have regular weekly watering. Plants will eventually hit 8-10’ high with a width of 3-4’. The compact height and width make Yellow Ribbon a stellar addition to foundation plantings. The thing is not going to get so huge in twenty years that it obliterates the front door or blocks half the picture window. It loves being sheared into a tight, formal or semi-formal, slim Christmas tree shape. Shear shortly after you see the first full blush of new growth in late spring. Shear half of this new growth. Shape and shear lightly again in late July. Hardy to Zone 4.